Thayne-san, today we’re headed to the main branch of Hotel Ryumeikan in Ochanomizu. I see. I didn’t know there was a hotel in the Toto Norenkai. That’s a surprise. And it’s only a few minutes from JR Ochanomizu Station, and the Awajicho, Ogawamachi and Shin-ochanomizu subway stations. What a great location! Welcome! 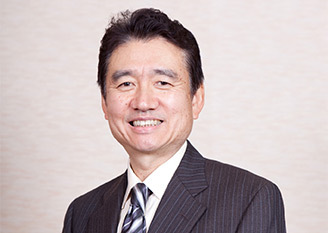 I’m Toshio Hamada, the president of Hotel Ryumeikan. Hello, Mr. Hamada. This entrance has a lot of style. The area from Ochanomizu to Kanda has changed a lot in recent years and now looks like a downtown area with high-rise buildings, and the Ryumeikan stands among this scenery. Is this where it was originally established? Yes. The Ryumeikan was established here in 1899. 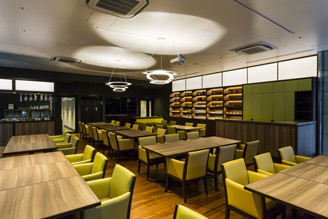 The first generation owner was the eldest son of the owner of the Naguraya Ryokan, which was built on the former location of Momokawa, a famous restaurant in Nihonbashi. 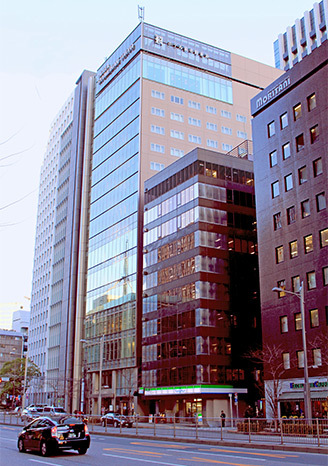 However, his older sister adopted a child to take over the business, so a new hotel was built to expand the business, and that’s when the Ryumeikan was established. At that time, it was a two-story wooden structure. They made a beautiful garden and spent a lot of money on the interior to give it an air of elegance, and it soon became a place where celebrities and socialites congregated. Shortly thereafter, the Gofukubashi and Sarugakucho branches were established. However, during the time of the second generation, the three hotels all burned down in the Great Kanto Earthquake of 1923. They managed to rebuild the hotels, but in 1945, the Gofukubashi hotel was once again burned down during the World War II air raids on Tokyo. The hotel is here now thanks to our predecessor’s hard work. My father was the third generation, and in 1976, he rebuilt the flagship hotel as a skyscraper. After that, my older brother succeeded him as the fourth generation owner. Now, he’s the chairperson, and I’m the president, and we work together, so you could say that the two of us together are the fourth generation owners. I’m the fifth generation. My father was the third, and in 1976, we rebuilt the flagship hotel as a skyscraper. Since then, my older brother and I have continued to run the establishment. Maybe you’d like to see the rooms, now? We renovated the hotel three years ago and turned all nine rooms into suites for mainly foreign guests. When you open the door, there’s a genkan entrance! We need to take off our shoes, don’t we? That’s right. The concept of this hotel is about experiencing culture. By staying at this hotel, you’ll be able to get a feel for authentic Japanese culture while relaxing. First, take off your shoes here. 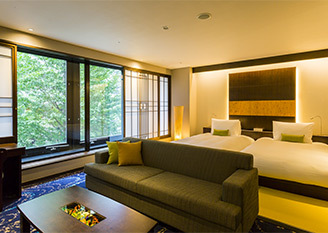 The guest room is a mixture of Japanese and Western styles, so you’re able to feel the comfort of tatami mats. There’s also a special Japanese futon that provides all the comfort you expect, and a shoji paper-sliding door in front of the window. We’ve incorporated various aspects of Japanese culture for our guests. The Japanese and Western design elements are in perfect balance. It’s very urban. 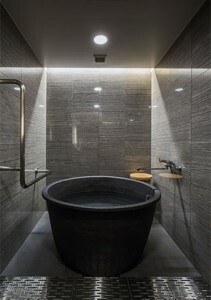 The bathroom is also really nice! Wait…How did you make this bathtub!? It’s made out of Shigaraki clay. 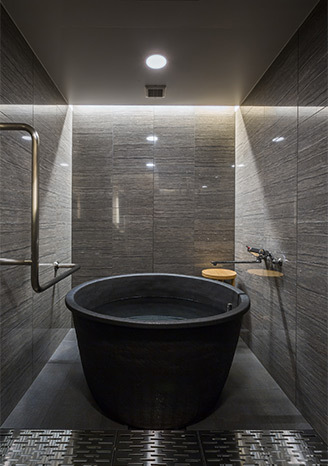 When you lie in the bathtub filled with hot water, you can completely immerse yourself in it, so our guests love how relaxing it is. So even now as a luxury hotel, the heart of hospitality from the time it was a famous ryokan has been passed down. That’s true. The wooden structure of the past is now completely gone, but we still have the Sophora tree that was here long ago. During the Great Kanto Earthquake of 1923, it was burned, but it soon began to grow again, and it’s still alive and doing well today near the hotel entrance. So now it’s kind of guarding over the hotel, isn’t it? By the way, did you start working here right after graduating college? After graduating, I worked in sales at a bank for 10 years, but I made a return to the hotel in 1985. Hotel and bank employees work completely different hours, so at first I found that difficult. Moreover, because all the staff were older than me, I couldn’t even get everyone to come to the regular morning meetings. (laughs) That’s quite a difficult situation to be in. It was my job, so it was what I had to do. I knew that I had to at least communicate with the staff, so I started eating meals with them, and even though I don’t drink much, I would invite them to go out for a drink now and then. My dad took my mother’s surname when they got married, so he had it rougher than I did. He worked hard from morning until night, taking care of customers and staff alike, and if a problem arose, he’d discuss it with them and come up with the best plan of action. In the ancient Seventeen Article Constitution of Prince Shotoku, there’s a short expression jowakaboku that means: When those above are harmonious and those below are friendly, and there is concord in discussions, right views spontaneously gain acceptance. The principal philosophy of our hotel is “harmony between people,” which we borrowed from this ancient constitution, and this is reflected in my father’s work. When did you become the president of the hotel? When my dad died, my older brother became the president, and I became the vice-president for about 10 years until 2005. Then my brother told me to take over as president, but for me, it was a lighter responsibility to serve as vice-president. When I told him I didn’t want to be the president, he scolded me and told me to grow up, so I eventually became the president. 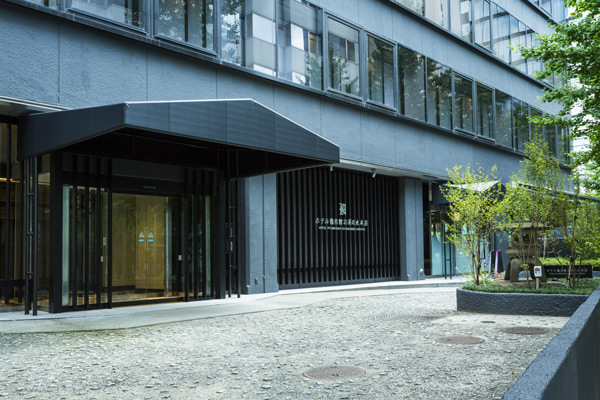 My brother became the chairperson while I became the president, and together we rebuilt the Gofukubashi branch under the name Hotel Ryumeikan Tokyo. Thayne-san, that’s a luxury hotel in a prime location just minutes on foot from Tokyo Station and Nihonbashi Station. It’s even in the Michelin Guide! We have 135 rooms at the Hotel Ryumeikan Tokyo, and every day we get both foreign and domestic guests. What plans do you have for the future, Mr. Hamada? Within 10 years, I’d like to establish five to ten more restaurants, and two or three more hotels. I’d also like to own a hotel in Europe someday. Thayne-san, the restaurants in the Ryumeikan hotels also have great reputations. If you go to the first floor at the hotel in Ochanomizu, there’s a tea-themed restaurant that serves Japanese cuisine with a modern twist. Oh really? In that case, let’s go now! I’d also love to spend a night here someday. It would be great to get into that amazing bathtub, and those beds look so comfortable! I’m sure I’d sleep like a baby. Thank you for showing us around today.